Onchi stars as Pandora, front, and Sonja Hinz as Hope. 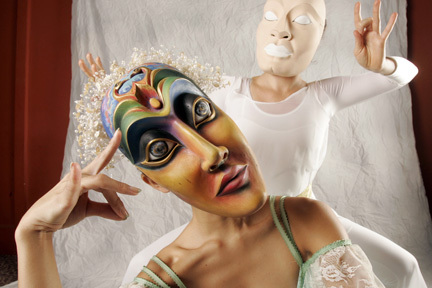 Pandora's curious spirit propels this darkly funny play inspired by vaudeville and Balinese mask drama. "Pandora & The Seven Deadly Sins" follows the lead character's discovery of a vaudevillian show where a playful but menacing cast of sinful characters entertain her in "Alice in Wonderland" fashion. Pandora then struggles with the question of how to achieve balance in the world when she discovers what it's like to be human. » What: "Pandora & The Seven Deadly Sins"
» Call: 956-7655; tickets go on sale March 28 by phone or at Kennedy Theatre Box office from 10 a.m. to 3 p.m.